Gary Vines' personal blog, mostly about archaeology and history, and some stuff about the world around me. The Abu Simbel complex continues to pervade Australian heritage conservation –i.e. if it is in the way of development, just move it to higher ground. Episode 5 spends an inordinate amount of time on the false hope that Emmaville could be the lost Banjo Paterson birthplace (but I thought we didn't celebrate our hero's birthplaces). A cursory examination of easily accessible records supports the majority view that Banjo was born at the main Narrambla homestead "8 chains north east of the memorial" erected for the purpose in 1947. At least one account confirms its location on land donated by a Lane decedent (the same owners when Paterson was born) and that the house was already demolished by 1946. The unveiling was done by Banjo's widow. Elsewhere the story of Emmaville can be traced through later owners including James Farrell, after whom the road it is on is named. 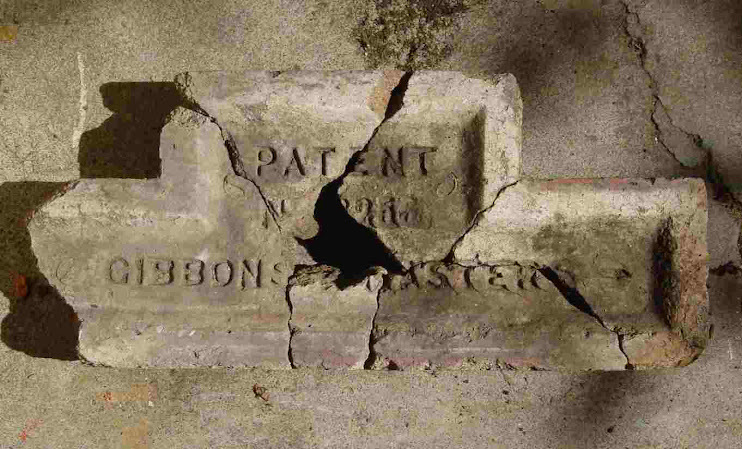 Having had first hand experience of a number of internecine historical society squabbles, I know to leave them alone, and that it is rare for there to be a logical assessment of historical and archaeological evidence in such cases. The producers of the series evidently researched Paterson’s origins "but were happy to keep his exact birthplace a mystery". The artificial conflict between the birthplace rivals is matched by the fight between memorial rivals, with the big statue people and the big hat shaped pergola people arguing it out in council. There might also be some subtle conspiracy theorist here to, with the main instigator being the mysterious Rotary Club. The artificial urgency created by the need to 'rescue' the building provides the drama but left me wondering what was the story about the development causing the problem in the first place. Some background on where the Emmaville/Patterson connection came from would have been good (sounded like just wishful thinking), and also why, what is clearly an important prefabricated timber building, went un-noticed in either the Orange Heritage Study, the council's LEP, or the previous historical accounts of the district. Even if it is not Banjo's birthplace, an important early house still has integrity despite being a sorry ruin. But what happened to the little outbuilding?, why is the chimney truncated?, and have they reversed the front? Similarly there are some fascinating elements to the building itself – the combination of imported Oregon? 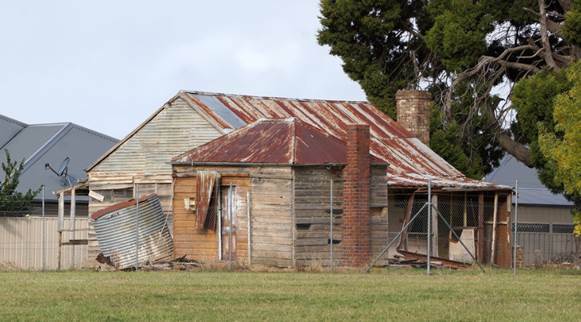 prefab – similar to the Fryerstown Weslyan Hall, nominally dated to the early 1870s. 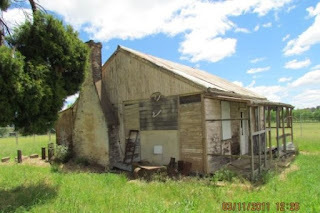 The pile of bricks left from Templer's Mill near the real Narrabla homestead, was described as "a classified historic building which should be preserved" in 1968, so one wonders who blew it up in 1971 and why. This is another case where the archaeology is pretty obvious, as evident in the ABC's photos, and Reg's comment that they will carry out archaeological investigations to solve the issue. Too late probably for whatever was under or around Emmaville in its original location. I don't always think there needs to be a team of experts to run these things and annoy the locals, but a Conservation Management Plan and archaeological assessment could have made an important contribution. At least they might have gotten the iron brand right, while Miles Lewis has suggested some possible American manufacturers such as W H Wrigley and William Elford, and even if viewers are not concerned about the difference between tongue and groove, 'v joint' and the more correct horizontal quirked bead boards, it doesn't hurt to get it right. It was a shame Peter Kirschner couldn’t narrate the entire episode. He seemed far more knowledgeable. Graeme Blundell pointed out the highly pleasurable camera movements, "placing each property exquisitely in the landscape, moving from ground level and soaring above the build, the lenses and focus changed remotely, …, creating a new highly cinematic aesthetic for property TV". – but we are probably coming to expect this since the ubiquity of the use of drones for everything from real estate adds to filming your snow trip. Blundell also catches the idea in "aspirational property evangelism". Whether we like it or not, the will probably end up steering the way restoration is done. Already it is being used by real estate journalists as a benchmark. Banjo Paterson Parks can be found all over the place Lynbrook, Ipswich, Gladesville, Jindabyne and Yass. I liked the big hat idea, but an online pole seems to have brought them back to their senses so the hat is off now. Sounds like fun. Let us know the progress on this one.